One tool that any good digital photo editing software program would have is a histogram and a way to manipulate the histogram. Histograms on your digital camera or displayed on your computer shows the distribution of light in a photograph, the darks to the left and the highlights to the right, while everything else is in between. The histogram is divided into 256 different values. The height of each part of the graph shows how much or how many pixels are displaying that value of light. Therefore you end up with a distribution of values within your shot. So your histogram becomes an enhanced light sensor. Many light sensors will just give you an average of the histogram. For example, if there was a high number of pixels displaying hard shadows such as a dark value of 5 and highlights of value 245, a camera’s light sensor would tell you that the light is somewhere around a value of 120. These two extremes are not the only settings that would get you a value of 120. Many other settings could get you that average and have a camera in automatic, using that light sensor, give you the wrong settings. The histogram allows you to see exactly what light your camera is seeing, and then it is your responsibility to ensure that you are setting the exposure in order to get the right lighting. The “right lighting” is typically a good distribution across the spectrum, if you have all your histogram crammed into the left corner you will have a photo that is too dark, if the histogram is crammed to the right you will have an over exposed image. 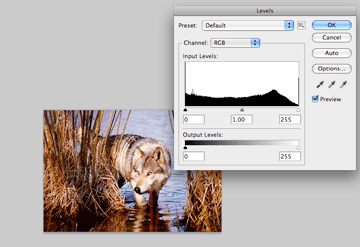 The histogram tool in photo editing software will allow you to tweak the histogram or better to tweak the exposure of your image and see what those changes do to your histogram. ← Why Do You Need a Neutral Density Filter?